Where are the wavetables ??? I like that a lot. I always held off on the v1 due to the slightly mind bending mirrored panel design. Wonder if its smaller. Would have been cool if it was 18HP. Third bottom slider might be the one to choose wavetables. VCA Drone? No I think VCA Drone is the attenuator at the bottom of mk1 since it leaves the VCA open when fully turned on >>> drone ! Makes sense ikkini. Looking forward to hear more about it. Interesting update, slew mode sounds good! I will stay with the MK1, especially because I want the compact yet playable size and I love the nice buttons. DA 1 is pretty much perfect in my opinion, only the lockups it has sometimes in OSC mode are annoying. Back when I asked Schneiders about it they were like "oh, we would have to sent it in, that will take months". So I never bothered. Was there ever a fix for the lockups that did not involve sending in the DA? I agree about MK1 being perfect. I don't think I will manage to fit another one in my case tbh. Never managed to lock mine and I think I abuse it quite a bit. How do you do it? On mine all diodes illuminate once I send super fast clock to trigger ins but it never locks.. Sorry for off topic. Its when its in OSC mode: turn down attack and decay on both sides to lowest setting. Set to loop. Modulate time with a sequencer. Mine has 50:50 chance of locking up within half an hour. Hainbach mine seems fine then. Never had an issue with that. Well more than upadates, these are different modules... As far as I'm concerned I'll keep my HD mk1 and DA Mk1. How about distortion on the vcas? it was sweet on the mk1. the last mk1 in my system is my DA. I got some brief glances of this from various NAMM coverage, but has anyone found a more detailed overview anywhere? I spoke with Scott at NAMM. 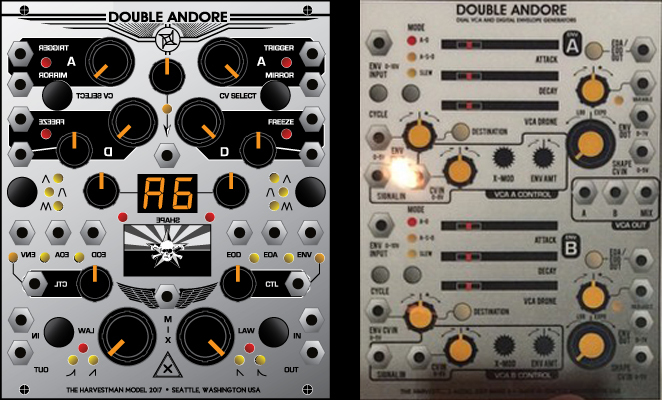 The variable waveshapes from DA1 are going to show up on an expander module.